Captain Shankar Rao Shankapan Walkar was born on 8th March 1943 in Kadgaon Village of Kolhapur district in Maharashtra. On 15th June 1969, he was commissioned to the Madras Regiment and served as a Mortar Officer of a battalion. During the 1971 war, there were various operations and skirmish on the western front between India and Pakistan. Captain Shankar Walker was serving as a mortar officer in a battalion of the Madras Regiment. On 16th December 1971, the battalion reached Hingore Tar after advancing 42 miles. Here the battalion came under the attack of heavy shelling from the enemy. As Mortar officer of the battalion, Capt. Walkar courageously walked up to each company position of the battalion to tie up for defensive tasks. In doing so, he was hit twice by splinters. Undeterred by injuries, he refused to be evacuated and carried on his task with full determination. The enemy shelling also continued the whole night and the next morning two companies of the battalion were assaulted. Nevertheless, Capt. Walkar continued his task of showing a rare display of courage and succeeded ineffective mortar fire on the enemy and inflicted them with heavy causalities. In this heroic act, he also shot four enemy personnel and kept fighting bravely until he succumbed to his injuries and made the supreme sacrifice. Captain Walkar was a valiant and committed soldier who displayed an act of gallant courage and heroism for which he was awarded Mahavir Chakra posthumously. 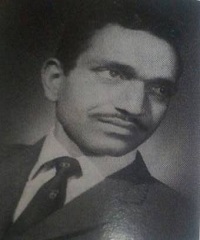 Captain Shankar Shankhapan Walkar was the Mortar Officer of a battalion of the Madras Regiment, during the recent operations against Pakistan on the Western Front. On the 16th December 1971, when the battalion reached Hingore Tar after advancing 42 miles it came under very heavy shelling from enemy positions. With utter disregard for his personal safety, Captain Walkar went to each rifle company position to tie up defensive fire tasks. In doing so, he was hit twice by splinters and sustained injuries, but he refused to evacuated and carried on with his tasks displaying outstanding courage and devotion to duty. Heavy enemy shelling continued during the night and early next morning the enemy assaulted two Company positions. Although wounded, Captain Shankar Shankapan Walkar inspired his men to hold fast, he himself shot at least four enemy personnel and forced the enemy to pull back. He was, however, fatally wounded in this action. After firing the last round, he succumbed to the injuries. Throughout Captain Shankar Shankhapan Walkar displayed conspicuous gallantry, inspiring leadership and exemplary devotion to duty. He fought bravely to the last. The Housing project of Shankar Enclave in Mumbai was named after Captain Shankar S Walkar, MVC.